Stana Katic is back for a second season with co-star Nathan Fillion in the snappy mystery series, Castle! New episodes start Monday, September 21 at 10pm/9pm Central on your local ABC station. The writers, IMO, have really found their legs on this series, and Stana's character, Detective Kate Beckett, has been given far more range and depth as the series developed last year than most series allow their lead actresses. Undoubtedly that's because Stana can handle it all. Likewise, fellow Canadian actor Nathan Fillion reaps the rewards of some dandy writing. On the series' fan-run website I've linked, unlike the network site, the writers are given top billing over the actors. If they continue to increase the quality they built upon last season, they'll deserve every bit of that notoriety. There's a growing depth woven among all the lead characters that engages us in a way that we want not just to see the weekly story, but the characters interact because there is, increasingly, more at stake for all of them. Mystery book readers .. "Richard Castle" has a book coming out - HEAT WAVE - it's on sale now from the series' web site and amazon.com; it will be released September 29. 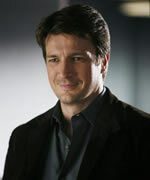 The character upon which writer Richard Castle bases his novel's female police detective, ala Kate Beckett, he names Heat. Thus, HEAT WAVE and other titles using the name Heat. Congratulations, Stana! Well deserved and good luck in season II! THE WHOLE TRUTH - Full Tilt! The Key Trailer for THE WHOLE TRUTH! Sure, making a film is hard work - but! More EPK interviews from THE WHOLE TRUTH!